There are always going to be times where we’ve forgotten something. It can be important, like your wallet, or small, such as a pen. Either way, when the time comes where you need it and it’s nowhere to be found, you’re going to have to go out of your way or Macgyver something to fix your current predicament. If you’d rather just be prepared than hoping you can find the tools you need when you need them, the IN1 Multi-Tool Utility iPhone Case can help. This is a polycarbonate case that has a nail file, tweezers, scissors, a toothpick, Philips and flat-head screwdrivers, and a blue and red pen. If all that isn’t enough, there’s a stand on the back that will let you watch videos in landscape mode. 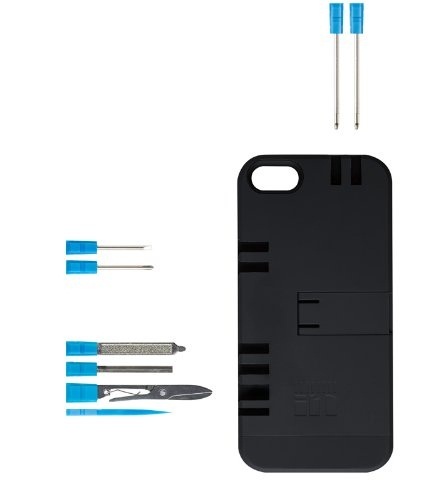 The case is available in black, white, or clear, with black, blue, green, orange, pink, or white accents for the tools. Thankfully, this is TSA compliant, so you can go anywhere in the world without having to shed this case. One possible problem in the future would be the pens running out of ink, but there’s a chance you can inquire about replacements. Just so it doesn’t scratch up your phone, the interior of this case is lined with felt to keep your mobile comfy cozy. This will cost you around $45, and will definitely come in handy.